As space lovers everywhere watched the live feed of NASA's Curiosity landing, another star was born -- but this one wasn't in the sky. He was in the NASA control room. WASHINGTON – As space lovers everywhere watched the live feed of NASA’s Curiosity landing, another star was born — but this one wasn’t in the sky. He was in the NASA control room. A man with a black and red mohawk was shown on the screen, working closely with his peers as the team prepared for Curiosity’s (ultimately flawless) landing on Mars. 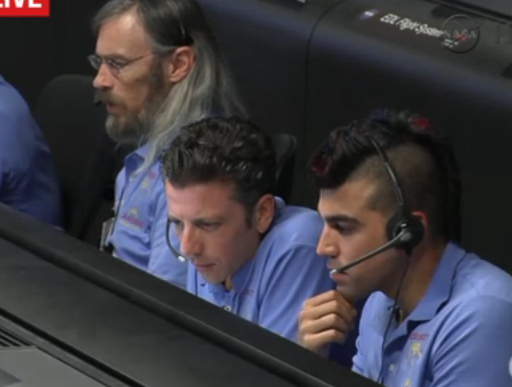 +50 points to the NASA Jet Propulsion Lab employee with the mohawk. Superannuated Hippy, Pompadour, and Captain Mohawk are my favorite NASA heroes. As many scoured the Internet, it wasn’t long before “Mohawk Guy’s” identity was revealed. Well, at least his Twitter identity. According to his Twitter account, which identifies him as “Bobak F.,” the mysterious man with the mohawk is a flight director for the Mars Science Laboratory Curiosity mission. After the safe landing, many continued to tweet their praises of the flight director. But others found the attention being paid to him annoying. So we’re landing a robot on Mars and my Twitter feed is busy objectifying the @nasajpl Activity Lead @tweetsoutloud (hot mohawk guy). So, while the jury may still be out on what “Mohawk Guy” thinks of his newfound fame, one thing is for sure: Curiosity wasn’t alone in making an impact Monday morning.